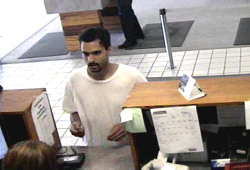 Credit union surveillance camera photo of Jimmie Lee Downing. A man suspected of robbing a credit union in Cedar Rapids was arrested less than half an hour after the crime was reported. Cedar Rapids Police Sergeant Cristy Hamblin says two citizens helped track the suspect as he ran from the scene, plus a Cedar Rapids Police substation is just a couple of blocks away from the credit union that was robbed. “(It’s) just really a cool story of citizen participation and officers being in the right place at the right time,” she says. Twenty-seven-year-old Jimmie Lee Downing has been charged with second degree robbery. Sergeant Hamblin says Downing did not have a weapon. “He walked into the bank, obviously a very desperate individual — didn’t have a mask on,” Hamblin says. “Just showed up with a note and demanded the money and left.” When the suspect left the bank, someone in the parking lot confronted him and delayed his escape. There was no vehicle waiting. Downing took off on foot. Sergeant Hamblin cautions that police do not “encourage actual physical confrontations” with suspects, but she says “being a good witness is always important” in helping police solve crimes. The suspect was not injured during his arrest, but he was taken to a Cedar Rapids hospital for a medical evaluation.